Back in the 50s, when most rock artists were not composing their own material, the non-performing songwriters who worked behind the scenes played an important role. Two such writers, Jerry Leiber and Mike Stoller, became perhaps as critical a part of the era’s music as the recording artists themselves. 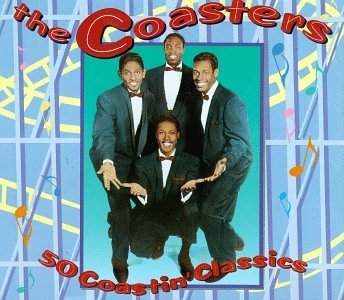 The Coasters were among the best interpreters of Leiber & Stoller’s material. The pair wrote and produced songs that became hits for the Coasters, the Drifters, Elvis Presley, the Shangri-Las, and many other groups and solo singers. During one five-year period, they helped make records that sold a total of more thna 30 million copies. Their first chart success came in 1951, with Charles Brown’s “Hard Times.” During the two years that followed, they wrote for such artists as Big Mama Thornton and Little Willie Littlefield. 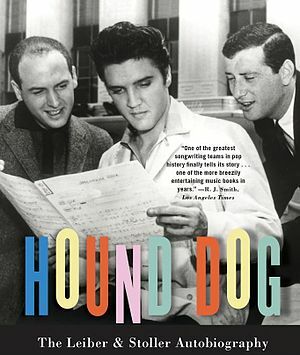 Thornton’s “Hound Dog,” composed by Leiber and Stoller, was a hit for her in 1953, and Elvis Presley’s version of the song achieved much greater sales three years later. Leiber and Stoller’s “K.C. Lovin’,” a 1953 single recorded by Littlefield, reached the top of the charts as “Kansas City” in Wilbert Harrison’s 1959 cover. In 1953, Leiber and Stoller launched their own record label, Spark, in Los Angeles. A group called the Robins, which had previously worked with the pair, signed to Spark and began scoring regional hits—”Riot in Cell Block Number Nine,” “Smokey Joe’s Cafe,” and others. “Smokey Joe’s” attracted the attention of the Atlantic label, which bought out rights to the best of the Robins’ material and took over their contract in 1956. Leiber and Stoller, discontinuing Spark, also came to Atlantic in that year. But, while producing and writing songs for that label, they maintained an independent status and were able to work for other companies as well. When the Robins’ lead and bass singers joined with two friends to form a new group, the Coasters, Leiber and Stoller found one of the best outlets for their talent. “Searchin’/Youngblood,” the group’s first pop hit, raced up the charts in 1957. Following up on that song, the band released such chart-toppers as “Poison Ivy,” “Along Came Jones,” “Yakety Yak,” and “Charlie Brown.” All of them were penned by Leiber and Stoller. As producers, the pair had equal success. In 1958, they joined forces with the Drifters, producing the hit “Drip Drop” and, the following year, “There Goes My Baby.” The latter song, which debuted Ben E. King as the lead vocalist replacement for Clyde McPhatter, was a giant success and is now remembered as one of the first R&B songs ever to use a string arrangement. When Ben E. King left the Drifters, Leiber and Stoller helped write his first single, “Spanish Harlem”—the recording of which was supervised by Phil Spector, then a Leiber and Stoller apprentice. Out of all their accomplishments, Leiber and Stoller will probably be best remembered for their pioneering work with the Coasters. “Yakety Yak,” a typical Leiber and Stoller song and one of the Coasters’ biggest sellers, shows the songwriting duo at their best. A masterpiece of the vernacular, the tune drove home the plight of teenagers with humor rather than preaching. Featuring, for example, Leiber and Stoller’s trademark rhythm break, filled by a line from the bass singer, the song was as much fun musically as it was lyrically. At first, some people viewed many of Leiber and Stoller’s tunes as nothing more than good novelty hits. But laced with truths about human nature that still strike home today, they have proved to be much more than that. It’s no wonder that their work is regularly recorded by everyone from Leon Russell to the Beach Boys to Loudon Wainwright III.